On the 4th of November 2018, we will be at Geneva’s boat show giving two conferences about our sailing experience and also participating in a forum. During the 4 years prior to our journey, Pierre has been carefully preparing Soledad. 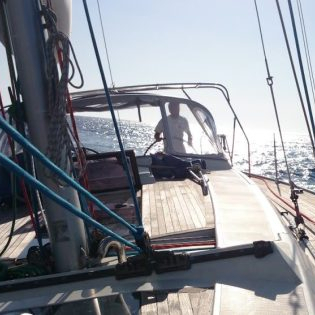 So carefully that at first it really looked like Soledad was his mistress 🙂 Most sailors know that “Sailing is fixing your boat in exotic locations” ; Pierre will be sharing how he prepared Soledad and worked during our trip to avoid that. Safety, telecommunication, comfort, electronics… what to take into account when you are going to do passages or long cruises. I am very excited to talk about my experience of being a woman in the sailing world. 6 years ago, I was learning to sail and I felt I was the worst trainee he ever had. Today, I am still learning and I want to inspire other women to take the helm and go sailing. We are looking forward to meeting you on November the 4th! Get your ticket for free now! Bravo María, es genial todo lo que estáis haciendo. Un abrazo muy fuerte!